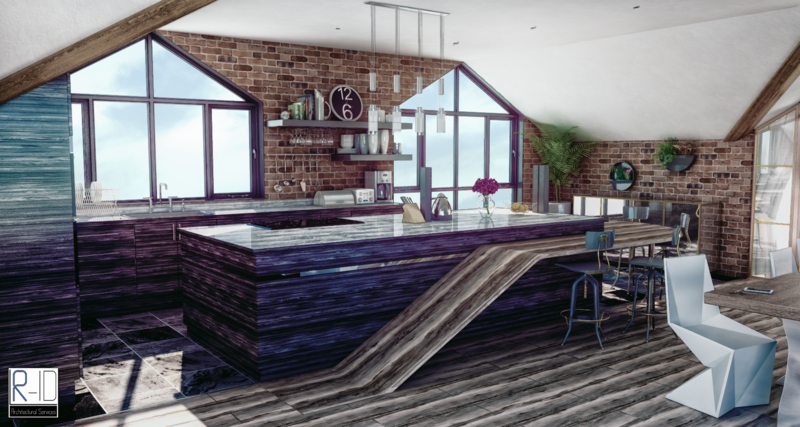 I would greatly appreciated any feedback on this kitchen concept for a conversion of a roof space into a penthouse flat. I'm not completely satisfied with the finished look - feel like something is not quite right that is not giving it that realistic look. After staring at this thing for a good few hours now, I feel its time for some fresh eyes, so any tips are welcomed. Especially post processing, as I feel thats where I'm losing the realism. Your textures are far too shiny and the PP has made everything worse. Not only that but your textures are way too repetitive. As a render, these are the things you really need to fix. In design terms, this whole design is just too 'noisy'. To my personal taste, everything is over-designed. It's visually jarring and that worktop simply won't work in that form. Those windows probably can't be built as modelled. Unless that's all the brickwork being supported, and above the apex there is a much lighter weight construction, those shapes are likely to need a thicker plate steel frame/lintel to support the load over that span.